A week, to misquote former Prime Minister Harold Wilson, is a long time in skiing. Too long, or so I thought, for Silver Star. The British Columbia resort merited wider recognition. That much I remembered from a visit some ten years earlier, but that was as far as it went. Somehow the decade or so which had passed since my previous visit had diminished it in my recollection. Would there be enough to sustain my interest, even for the four and a bit days I had booked there last March? I must have been looking through the wrong end of the memory telescope. Re-acquaintance immediately dispelled such doubts. Even ten years ago Silver Star must have packed enough punch to keep a good skier happy for at least that long; but since then all but one of its chairlifts have been replaced and a whole new swathe of skiable terrain opened. And while I was perhaps correct when recalling that there were few places to eat when skiing was done, that is certainly not the case now. A little geography: Silver Star is about 45 minutes from the Okanagan town of Vernon, about one hour's flight east of Vancouver, in the interior of British Columbia. The Okanagan is an extraordinary region, full of vineyards and orchards. It enjoys extraordinarily hot summers, when temperatures can reach the upper thirties. Part of it has a desert climate. Even in mid-winter it comes almost as a surprise to find snow at higher altitudes. There was plenty. About 25 centimetres had fallen two days before my arrival and while a brief return to warm weather had set concrete on unpisted runs, conditions on groomed trails remained good – not least in the mainly intermediate area served by the Silver Woods Express chairlift, which opened only three years ago and is a little lower than the resort centre. Cloud Nine, a blue trail with a section steep enough to jolt anyone in search of a gentle cruise, was in great nick, while the snow between the trees in the black diamond Glade runner was too hard for my old knees to contemplate. Black diamond expert runs are strictly off limits for these guides but out at Putnam Creek ours pointed me down a couple and suggested I take off on my own. For challenge seekers, Putnam Creek is Silver Star's jewel. I went swinging down a perfect pitch called Holy Smokes, which had been groomed by winch cat, though better of several precipitous double blacks and foolishly accepted an invitation to take Pipeline, which incorporated a very steep and tricky drop off. Next day I went back for more – Bon Diablo, Larch, and a satisfying work out on Caliper Ridge, where scrutiny from the Powder Gulch chair imposes discipline on wayward technique. At first glance the resort's appearance is that of a Victorian gold or silver mining town – but it is entirely ersatz, No mining was ever done there, but a property covenant has ensured that houses there have largely conformed to the image. Think the Bates' home in Psycho – but more cheerful. They must be painted, resort services manager Robin Baycroft told me, in at least six colours. The result is a somewhat bizarre patchwork of pastel shaded façades and balconies, some right on the ski runs. It's odd to think that this, an early example of such themed development, might have been acquired by the supreme creator of the homogeneous resort. According to Baycroft, Intrawest, developer of ski centres from Whistler to Arc 1950, was “sniffing around” Silver Star when it was up for grabs in 2001. 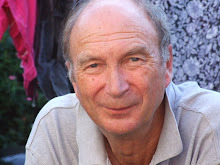 The resort was bought, however, by the Schumann family, which owns Big White, not least to avoid that resort having to function in the shadow of such a powerful neighbour. 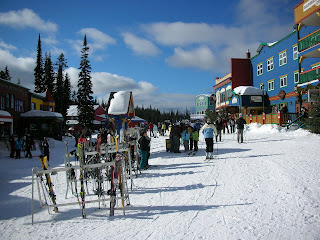 I had come to Silver Star via two other interior BC resorts – Sun Peaks and Big White. 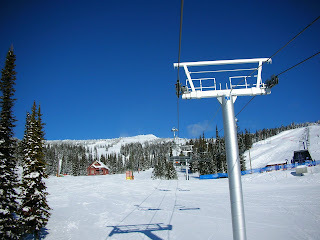 Sun Peaks has expanded, too. Its passionate promoter, Canadian national treasure Nancy Greene, who had just celebrated the 40th anniversary of her gold and silver medal triumphs in giant slalom and slalom at the Grenoble Olympics, showed us over its latest addition, Mount Morrisey. A new chair there leads to a few black runs which are, in local parlance, fairly “gnarly” but serves mainly intermediate territory. Nancy, who still skis regularly with guests, proudly noted how widely spaced trees had been left standing to add interest to these lovely, undemanding runs. Most of my black diamond runs were above in treeless Crystal Bowl - still served by two tediously slow chairs - which I had missed out on during a previous visit because of poor visibility. For the same reason I had also suffered from a jaundiced but false impression of Big White, which shares a its lift pass with Silver Star. 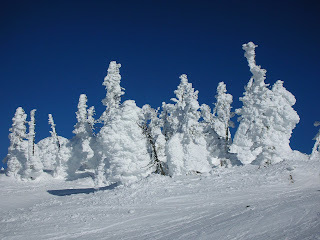 Higher than its stable mate it is famous for its characteristic “snow ghosts” - fir trees on its topmost slopes which storms cloth in frozen snow, creating spectral figures. Big White had not added much, if any, terrain but was far more extensive than I had thought. Heavy snowfall followed by sunshine produced two of the finest days' skiing I had enjoyed for some time. While relatively few runs here are dauntingly steep there was delicious glade skiing in fresh powder and magnificent, energy sapping black diamond trails from the Powder, Falcon and Gem Lake Express lifts. It was not difficult to take in all three resorts in a fortnight. In good conditions the drive from Sun Peaks to Big White is about 3hrs 30mins and from there to Silver Star takes a little over 2hrs. I enjoyed all three much more than memory had promised and a week in each, I concluded, would pass much more quickly than a week in Westminster.